Asian markets rose yesterday as Donald Trump struck an upbeat note on trade talks with China, while the pound held steady after British MPs voted to delay Brexit. While there remain some concerns about the global outlook, investor confidence has been supported by ongoing optimism that the world’s two biggest economies will eventually hammer out a deal to end their long-running trade row. Yesterday, China approved a foreign investment law that will abolish the forced transfer of technology from foreign firms to local joint-venture partners, addressing a key point of anger in the White House. “There is a pretty good backdrop going forward,” said Margaret Patel, portfolio manager at Wells Fargo Asset Management. “We’re in a low-inflation environment for the foreseeable future and that really changes the equation about equity values -- they can go higher. The Fed isn’t going to do much and inflation remains stubbornly low,” she told Bloomberg TV. On currency markets the pound stabilised after a week that saw wild fluctuations as Prime Minister Theresa May suffered a series of embarrassing defeats in parliament as she struggles to push through her Brexit deal. Having seen it thrown out for a second time Tuesday, she will get a third crack of the whip next week after lawmakers eventually agreed to ask Brussels for a delay to the March 29 deadline for leaving the EU. If her agreement passes, then May will ask for an extension to June but if it is rejected by MPs again she could ask for a much longer delay. However, it will be up to the other member states to unanimously agree to an extension. “If it fails again ... the Prime Minister will have to go to the EU Council next week and throw herself on the mercy of the leaders of the (other EU countries) and hope they are feeling generous,” said Michael Hewson, chief market analyst at CMC Markets. Gunatilleke said Sanken has the knowhow and experience to go for large projects, but is held back by finance, as it is currently developing many properties. 1987 අංක 36 දරන ශ්‍රී ලංකා සුරැකුම්පත් හා විනිමය කොමිෂන් සභා පනතේ 53 වන වගන්තිය ප්‍රකාරව, ශ්‍රී ලංකා සුරැකුම්පත් හා විනිමය කොමිෂන් සභාව විසින්, 2001 වර්ෂයේ දෙසැම්බර් 18 දිනැති අංක 1215/2 දරන අතිවිශේෂ ගැසට් පත්‍රය මගින් නිකුත් කර ඇති රීතීන් හි අංක 4 (2) දරන රීතියට අනුකූලව සමාගම් 6 ක්, කොළඹ කොටස් හුවමාරුවේ නිල ලැයිස්තුගත ලේඛනයෙන් ඉවත් කිරීමට, කොළඹ කොටස් වෙළෙඳපොළ අධ්‍යක්ෂ මණ්ඩලය විසින් තීරණය කර ඇත. මේ අතර ටච්වුඩ් ඉන්වෙස්ට්මන්ට්ස් පීඑල්සී හි කොටස් ගනුදෙනු 2014 ජූනි 05 වන දින සිට සහ ඔරියන්ට් ගාර්මන්ට්ස් පීඑල්සී හි කොටස් ගනුදෙනු 2016 අප්‍රේල් 06 වන දින සිට අත් හිටුවා තිබේ. ඉහත කී සමාගම් 4 ම මේ වන විට ඈවර කිරීමට කටයුතු ආරම්භ කර ඇත. අදාළ මූල්‍ය ප්‍රකාශන නිසි කලට නිසියාකාරයෙන් ඉදිරිපත් නොකිරීම හේතුවෙන් මිරාමා බීච් හොටේල් පීඑල්සී හි කොටස් ගනුදෙනු 2015 පෙබරවාරි 26 දින සිට අත්හිටුවා තිබේ. මෙම සමාගම්, කොටස් වෙළෙඳපොළ නිල ලැයිස්තුවෙන් ඉවත් කරනු ලබන බවට දැන්වීමක් 2019 මාර්තු 13 දින පුවත්පත් මගින් ප්‍රකාශයට පත් කළ අතර, කොළඹ කොටස් හුවමාරුවේ අධ්‍යක්ෂ මණ්ඩලය විසින් ගන්නා ලද මෙම තීරණය හේතුවෙන් පීඩාවට පත්වන අයෙකුට, මෙකී දැන්වීම පළ වී දින 14 ක් ඇතුළත, ශ්‍රී ලංකා සුරැකුම්පත් හා විනිමය කොමිෂන් සභාව වෙත අභියාචනයක් ඉදිරිපත් කළ හැකිවේ. මෙහිදී ශ්‍රී ලංකා සුරැකුම්පත් හා විනිම කොමිෂන් සභාව වැඩිදුරටත් කියා සිටින්නේ මෙකී දින 14 ක කාල සීමාව අවසානයේ දී පෙර කී අයුරින් අභියාචනයන් ඉදිරිපත් කර නොමැති නම්, මෙම සමාගස්වල සුරැකුම්පත්, නිල ලැයිස්තුගත ලේඛනයෙන් ඉවත් කිරීමට කොළඹ කොටස් හුවමාරුව විසින් ක්‍රියා කරනු ඇති බවයි. The plant when completed in 18 months would have an annual capacity of 3.6 million metric tonnes, Mangala Yapa, technical advisor to the ministry of international trade and investment said. The plant will have a convered conveyor from the port to carry clinker minimizing environmental fallout from unloading, Yapa said. Ceylon Steel, the main investor of the new cement plant is now protected by high anti-competitive import duties, so that the firm can make easy profits by restricting competition. High steel costs have forced, a homeless family trying to build a house, a shop owner, office builder, a hotelier and even a factory owner to pay high prices for steel, pushing up construction costs. High construction costs has contributed to make Sri Lankan services like tourism less competitive compared to free countries in East Asia and also make ordinary people building a house more indebted to banks critics have said. පෙර පැවති මට්ටම්වලට කොටස් වෙළෙඳපොළ යළි පැමිණීමට නම් සිදු කළ යුතු බොහෝ දේ ඇති බව අග්‍රාමාත්‍ය රනිල් වික්‍රමසිංහ මහතා පවසයි. “අපි කොටස් වෙළෙඳපොළ ගැන අපි අවධානයෙන් ඉන්නවා. සේවක අර්ථසාධක අරමුදල (EPF) යළිත් වරක් කොටස් වෙළෙඳපොළට ප්‍රවේශ වී සිටිනවා. එය විශ්වාසය ඉහළ දමන්න සහාය වෙනවා. පෙර පැවති මට්ටම්වලට කොටස් වෙළෙඳපොළ පැමිණීමට නම් තව බොහෝ දේ සිදුකරන්න තිබෙනවා. කොටස් වෙළෙඳපොළ මේ වෙනකොට කිසිවකුගේ හෝ අවධානයක් නොමැති ස්ථානයක් (Ghost Town) බවට පත්ව ඇති බවත් එහි නිරත හයදහසක් හත්දහසක් පමණ වන පුද්ගලයින් වෙනුවෙන් කොටස් වෙළෙඳපොළ යථාතත්ත්වයට පත්කරලන්නට රජයට සහාය විය හැකිදැයි යනුවෙන් පසුගිය දා පැවති Fireside Chat ව්‍යාපාරික සංවාදාත්මක සන්ධ්‍යාවේ දී, සභාව මෙහෙයවන ලද දිනේශ් වීරක්කොඩි මහතා කළ විමසීමට ප්‍රතිචාර දක්වමින් අග්‍රමාත්‍ය රනිල් වික්‍රමසිංහ මහතා මේ බව කියා සිටියේය. කොටස් වෙළඳපොළේ සමාගම් ලාභ නොලබන්නේ නම්, කොටස් වෙළෙඳපොළේ පරිහානිය පිළිබඳව අමුතුවෙන් කියන්න යමක් නොමැති බව ප්‍රකෝටිපති ව්‍යාපාරික ධම්මික පෙරේරා මහතා පවසයි. පසුගිය (19) දා කොළඹ පැවති Fireside Chat සංවාදාත්මක සන්ධ්‍යාවේ දී ඔහු මේ බව කියා සිටියේය. Thanks Nihal. After maintaining anti-CSE financial policies for three years now only they look at it when elections are round the corner. There are many negative impacts on economies all over the world. But hoping soon those will go away and positive side may come sooner. Wall Street stocks finished a volatile session mostly lower on Wednesday following a dovish Federal Reserve decision, while the pound dropped amid Brexit chaos as Britain tries to avoid a damaging no-deal exit. Now only PM realize the importance of controlling the interest rate of banks. Even student who study on economics can understand this scenario. When ever interest rates low people will move to invest there money on different investments. The government will collaboratively work with the banking sector to bring down the high market interest rates in the country, to boost private investment in order to support economic growth, Prime Minister Ranil Wickremesinghe said. “We have to talk to both state and private commercial banks as to how their lending rates would come down. This is essential for the private sector to get ahead. However, the continuation of fiscal consolidation has to go on,” Wickremesinghe said. The premier noted that the high interest rates are one of the reasons for low economic growth the country is experiencing at the moment. “Sri Lanka’s real interest rates are currently the highest in the region. There is a substantial difference between the market rates and Central Bank lending rates. These are some of the impediments to reasonable economic growth,” he said. He said the Central Bank would take measures to reduce the high interest rates, without any changes to the policy rates, with potential further reduction in the Statutory Reserve Ratio (SRR) and releasing margin deposits to the banking system. The Central Bank has already taken measures to address the liquidity deficit in the rupee market with two SRR rate cuts last year and this year. “The liquidity shortage itself has been reduced from Rs.94 billion in November last year to Rs.12 billion at present. 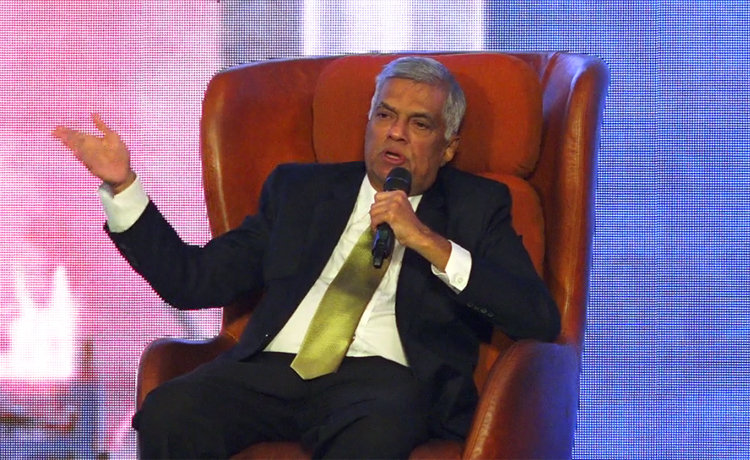 This has resulted in Rs.150 billion coming into the market,” Wickremesinghe said. The government is planning to pump over Rs.300 billion into the economy in coming months through development programmes such as Gamperaliya and Enterprise Sri Lanka. Wickremesinghe said the government has settled a significant amount of outstanding treasury bills, pointing out that only Rs.30 billion remain to be settled for last year, compared to R.136 billion when the government came into power in 2015. “There were Rs.136 billion outstanding bills when we came to power and we settled all of that. We also settled the outstanding bills in 2016 and 2017. In 2018, we settled Rs.60 billion of total outstanding Rs.90 billion,” he said. Which could definitely be a welcome message, Prime Minister Ranil Wickremesinghe this week said the state-run private sector pension fund, the Employees’ Provident Fund (EPF), would re-enter the Colombo bourse soon. He noted that the EPF’s return would certainly help to raise the sentiment in the market. Since 2015, the EPF had refrained from making new investments in the Colombo Stock Exchange (CSE), as the fund failed to garner any returns on the investment it made in the CSE. On top of that, the alleged involvement of the EPF in the infamous treasury bond scandal made the Central Bank to suspend the fund’s all secondary market activities. According to the 2016 annual report of the EPF, the fund incurred a combined loss of Rs.8449 million in 2015 and 2016 from its investments in the CSE. The fund, with a membership of 2.6 million at end-2017, had grown to a value of Rs.2,060 billion. The Colombo Stock Exchange (CSE) has renewed the call for the return of captive funds such as the Employees’ Provident Fund (EPF) to reinvigorate the ailing market. 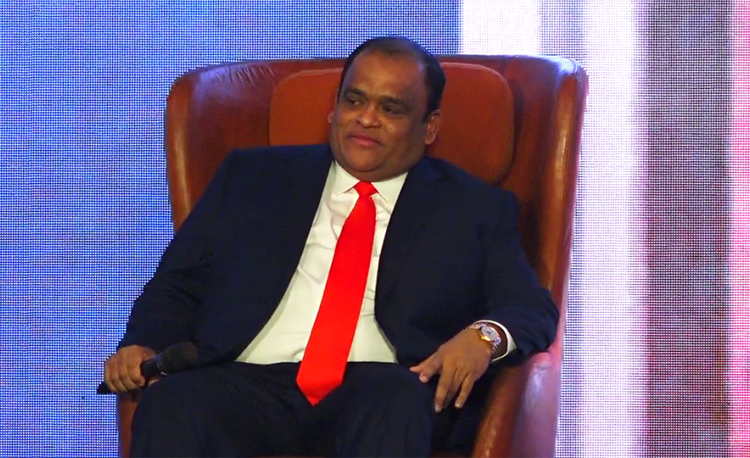 CSE Chairman Ray Abeywardena during a capital market conference held in Colombo last week said getting the captive funds back to the market is in the top of his “wish list”. Abeywardena said it was a “miracle” that the market had survived the last four years without a single local captive fund investing in the market despite the assurance from those in power that the EPF would be permitted to get back to the market. He was of the view that it was high time that safeguards were put in place to monitor investments made by the captive funds and that they can be restricted to investing in the top 20 companies only. Responding to a query, he said those who were responsible for dumping shares to the EPF and other state-run funds—the key reason for these funds to be kept away from the market—must be brought to book to ensure that others are not penalized for the past wrong doings of a few. While the foreign investors continue to be prudent in their stock selection and continue to make investments, the local funds are unable to seize the opportunity, he lamented. Meanwhile, Abeywardena said the CSE plans to hold more foreign road shows this year to market Sri Lanka’s capital market, which is backed by excellent valuations. He pointed out that the bourse is trading comparatively cheap at under nine times on multiples. He also said the CSE conducted around 450 seminars last year to educate the prospective local investors on how to invest in the market and what to look for when investing. Responding to a question on the plight on the unit trust (UT) industry, he agreed that the penetration has been poor despite the UT industry being in existence since the early 1990s. The tax incentive increased the assets under management but did not increase the number of UT holders. He was of the view that the investors within a Rs.100,000 or less should first be directed to invest in UTs and thereafter be permitted to invest directly in the equity market. Commenting on the debt capital market, Abeywardena stated that discussions are underway to list both the government sovereign bonds and local treasury bills on the exchange, which will definitely create more awareness to the market. Abeywardena further stated that regardless of what government is in power, the policies and the directives of the regulators must not change. ගෙවී ගිය වසර 6කුත් මාස 3 ක කාලපරිච්ඡේදය තුළ දී කොළඹ කොටස් වෙළෙඳපොළ මිල දර්ශක වාර්තා වූ පහළම මට්ටම මේ වන විට වාර්තා වී තිබේ. පසුගිය මාර්තු 21 බ්‍රහස්පතින්දා දින ගනුදෙනු අවසානයේ දී කොටස් වෙළෙඳපොළ සියලු කොටස් මිල දර්ශකය ඒකක 5,571.30 ක් ලෙසින් සටහන් වූ අතර මෙය 2012 දෙසැම්බර් 26 වනදායින් පසු වාර්තා වූ අඩුම මට්ටම ලෙසින් වාර්තා වේ. එසේම 2019 වසර තුළ දී මේ දක්වා සියලු කොටස් මිල දර්ශකයේ පහළ යාම 7.95% ක් ලෙසින් සටහන් වී ඇත. තවද කොටස් වෙළෙඳපොළ සමාගම් අතුරින් ඉහළ ද්‍රවශීලතාවයක් හා කාර්යසාධනයක් සහිත සමාගම් 20 ඇසුරින් ගණනය කෙරෙන S&P SL20 දර්ශකය, වසර ආරම්භයේ පැවති ඒකක 3,111.07 සිට ඒකක 2,741.31 ක් දක්වා මේ වන විට පහළ ගොස් ඇත. මෙය වසර ආරම්භයේ සිට මාර්තු 21 දක්වා කාලය තුළ දී 12.56 ක පහළ යාමකි. මේ අතර පසුගිය සතියේ කොළඹ දී පැවති ව්‍යාපාරික සංවාද සන්ධ්‍යාවක දී අග්‍රාමාත්‍ය රනිල් වික්‍රමසිංහ මහතා කියා සිටියේ, තම රජය කොටස් වෙළෙඳපොළ පිළිබඳ නිරන්තරයෙන් අවධානයෙන් පසුවන බවත්, පෙර පැවති මට්ටම්වලට කොටස් වෙළෙඳපොළ පැමිණීම සඳහා කළ යුතු දෑ බොහෝ බවත්ය. එසේම සේවක අර්ථසාධක අරමුදල යළිත් වරක් කොටස් වෙළෙඳපොළ ආයෝජන සඳහා ප්‍රවේශ වී සිටින බවද අග්‍රාමාත්‍යවරයා මෙහිදී අවධාරණය කළේය. කෙසේ වෙතත් මෙම සාකච්ඡා සභාවේදීම අදහස් දක්වමින් මෙරට ප්‍රකෝටිපති ව්‍යාපාරික ධම්මික පෙරේරා මහතා කියා සිටියේ, සමාගම්වල ලාභ පහළ වැටෙද්දී, කොටස් වෙළෙඳපොළේ කඩාවැටීම පිළිබඳව අමුතුවෙන් කියන්න දෙයක් නොමැති බවයි. සමාගමේ වෙත පනවා ඇති බදු මීට ප්‍රධාන හේතුවක් වී ඇති බවත් බැංකු අංශයේ මෙකී බදු ප්‍රතිශතය 63% ක් බවත් ඔහු මෙහිදී කියා සිටියේය. 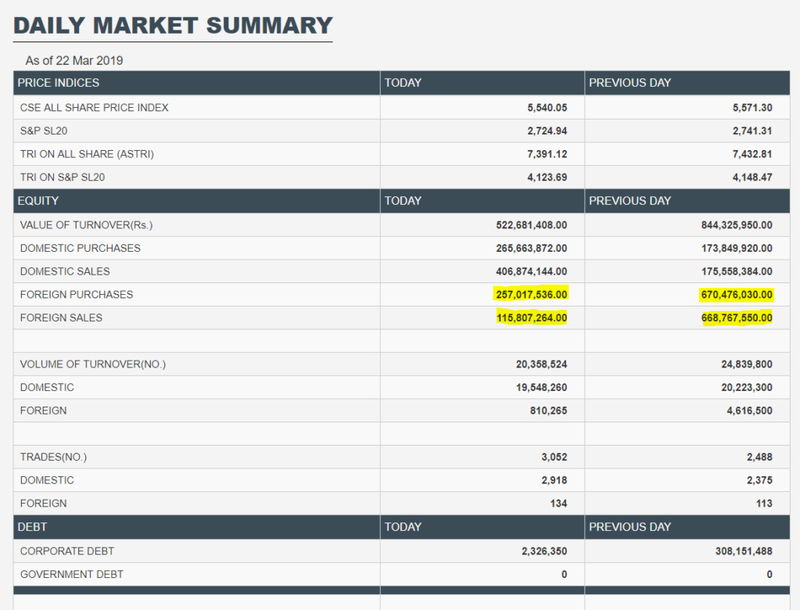 Even though market index going down it seams foreigners doing the investments in the SCE if you see the last couple of days Foreign selling are lower than the Buying. The new chairman of the Securities and Exchange Commission [SEC] has successfully faced the challenge of capacity building at the institution and actually taken on certain offenders. Ranel Wijesinha has managed to beef up the Investigations Division within six weeks of becoming the chairman. Having kept a relatively low profile, this is the first occasion since taking office that he has spoken to the media, on investigation matters. “I have been intensely focused on building the inside before battling the outside, while focusing in parallel on capital market development,” he told the Business Times in an interview. SEC in the past nearly four years has got a lot of flak for not completing or re-starting investigations – especially against the stock market mafia. The worst manipulations of the stock market including pump and dump of stocks by high net worth investors were during 2010 to 2012 and then SEC Chairperson Indrani Sugathadasa resigned from her post under pressure in December 2011. Then Thilak Karunaratne was appointed by then President Mahinda Rajapaksa but less than a year later he was asked to step down by Mr. Rajapaksa. In 2015 when Mr. Karunaratne was reappointed, they were shaken up but nothing happened. Also the SEC had a capacity issue. He had experienced a culture of suspicion between and among a few of the SEC people when he took office. “Certain persons were perceived to be representatives of the previous regime or supporters of the previous regime or representatives of what is termed the ‘market mafia’. Some were even sidelined. That era of favourites, or being suspected, sidelined, transferred, or made dormant, is now over,” he said stressing that he’s neither green, nor blue, nor red nor saffron without personal agenda, no passion to hold public office, no private vested interest or personal interest to make private profit. He added that on and off site supervision of brokers, has been substantially strengthened. Over the recent months several show cause letters and notices of action have been served on market participants.”We have a warm and mutually respectful dialogue with the Colombo Stock Exchange (CSE) and all stakeholders,” Mr. Wijesinha added. The Supervision Division had many pending complaints against brokers and margin providers and some complaints initially made to the CSE dated back to 2015. “These complainants, recognising that there was a new administration at the SEC, spoke to, met with me and submitted written complaints direct to the Chairman’s Office. We established a Complaints Review Committee as provided for in the SEC Act but not operationalised for almost four years and resourced it with senior commissioners who are experienced accountants and lawyers,” Mr. Wijesinha said. The Director Investigations position has been vacant for a number of years. “We then drafted a very different advertisement and 15 people applied. However only a few were suitable and the selected candidate may be recruited, however for another division. This is a challenge. Until we fill this vacancy, the Director General is heading this position,” Mr. Wijesinha added. ECONOMYNEXT –India’s housing project in Sri Lanka with a grant of almost 50 billion rupees (over 350 million US dollars) is the largest Indian grant assistance project in any country abroad, High Commissioner Taranjit Singh Sandhu said. Of the total commitment of 63,000 homes, 47,000 houses had already been built, he said, at the opening of the Bhagat Singh Puram housing project, a high commission statement said. The project in Helboda estate, Nuwara Eliya, consists of 98 houses built under Indian Housing Project in Plantation Areas. The homes were handed over to the beneficiaries jointly by Sandhu and Minister of Finance of Sri Lanka Mangala Samaraweera in the presence of Palani Digambaram, Minister for Hill country New Villages, Infrastructure and Community Development, Gayantha Karunathilake, Minister of Lands and Parliamentary Reforms, and Radhakrishnan, Minister of Special Area Development. The village was named after Bhagat Singh, a famous Indian freedom fighter and youth icon, whose martyrdom day fell on 23 March. Samaraweera described India as a true friend, always ready to assist Sri Lanka during emergencies and crisis situations. Sandhu said India has undertaken more than 70 people-oriented development projects in various fields including health, education, housing, skill development, infrastructure, vocational training among others, across the country. The overall development portfolio of the Government of India in Sri Lanka is close to three billion dollars out of which 560 million dollars are in grants. The Board of Investment (BOI) has approved an estimated US $ 5.1 billion worth of new investment projects in the first quarter of this year, including a steel plant project to be set up in Trincomalee, with an investment of US $ 1 billion, the latest BOI statistics showed. An estimated US $ 4.9 billion worth of investments will be foreign direct investments (FDI), while US $ 168 million will be local investments. In addition, the BOI also approved 13 expansion projects, worth of estimated US $ 142 million, by firms already registered under the BOI. A large chunk of investments worth US $ 3.9 billion will go into the utility sector, which includes a US $ 3.85 billion joint venture between India-based Accord Group and Omani state-controlled Oman Oil Co, to set up an oil refinery in Hambantota. Oman Oil and Gas Minister Mohammed bin Hamad Al Rumhy last weekend joined Prime Minister Ranil Wickremesinghe to lay the foundation stone for the oil refinery in Hambantota. Meanwhile, an estimated US $ 1.2 billion worth of investments will go into the manufacturing sector, which includes a US $ 1 billion investment to set up a steel plant in Trincomalee. The Development Strategies and International Trade Ministry is currently in the process of transferring a 500 to 700-acre land in Trincomalee, nearby the Trincomalee harbour, to the BOI, in this regard. A Singapore-based firm, which is the main investor of the project, plans to set up the plant targeting steel exports to the region. The BOI also approved US $ 30 million worth of investment projects into Sri Lanka’s apparel sector and another US $ 18 million worth of investments into the agriculture sector. Furthermore, an estimated US $ 17 million investment will also be made into the service sector. The Development Strategies and International Trade Minister Malik Samarawickrama noted that the majority of investments are expected to realise within two to three years. These investment projects are expected to generate over 8000 employment opportunities in the country. Development Strategies and International Trade Deputy Minister Nalin Bandara recently said that the first stage of recently inaugurated Bingiriya industrial zone has attracted interest from several firms, including Smart Shirts, Brandix, Colombo Dockyard and Sanmik Foods, to set up their plants in the zone. As the space runs out in the zone, Bandara said that the second stage of the zone would be launched soon on a 284-acre land, while an additional 630-acre land would also be added to the zone in the future. Sri Lanka attracted US $ 2.3 billion worth of FDI last year, falling short of the US $ 2.5 billion target, despite a 38 percent year-on-year increase from the US $ 1.78 billion recorded in 2017. According to the BOI, 52 percent of investments came from projects approved prior to 2015, while the remaining 48 percent was received from projects approved after 2015. BOI Director General Champika Malalgoda noted that Sri Lanka is now attracting more investment into the tradable sector, moving away from the environment where the majority of investments flowed into the non-tradable sectors such as property development. She expressed her confidence in achieving the targeted US $ 3 billion in FDI this year, with the realisation of big-ticket investments. ECONOMYNEXT- Sri Lanka's rupee closed at 176.10/25 to the US dollar in the spot market on Thursday, while stocks gained 0.81 percent and bond yields were stable, brokers and dealers said. The rupee strengthened to 176.20/35 on Wednesday from 177.40/55 a day earlier. At the Colombo Stock Exchange, the All Share Price Index gained 44.51 points to close at 5,556.28, ending a two-week slide, while the more liquid S&P SL20 Index closed 32.62 points higher at 2,736.49. Market turnover was 457.77 million rupees. There was heavy foreign participation, with net outflows of 46.8 million rupees from the market. Around a third of the turnover was through foreign-to-foreign selling of index-heavy John Keells Holdings (JKH), brokers said. JKH contributed to the All Share's gain, closing 5.20 rupees higher at 156 rupees per share, after reaching an intra-day high of 157 rupees per share. The government securities market had moderate trading, with a slight gain in yields in the morning, followed by a return to previous levels towards the afternoon, dealers said. Twelve-month bills closed at 10.25/35 percent Thursday in mid-morning trade, unchanged from Wednesday. A bond maturing on 01.08.2021 closed at 10.53/60 percent marginally down from 10.55/60 percent. A bond maturing on 15.07.2023 closed at 10.85/95 percent, unchanged from the previous close. A 5-year bond maturing on 15.03.2024 closed at 11.00/02 percent on Thursday, up from Wednesday's 10.98/02 percent. A bond maturing on 01.08.2026 closed at 11.10/20 percent, up from 11.05/20 percent. A bond maturing on 15.06.2027 closed at 11.30/35 percent, unchanged from the previous close. A bond maturing on 01.09.2028 closed at 11.33/40 percent, up from 11.30/38 percent. 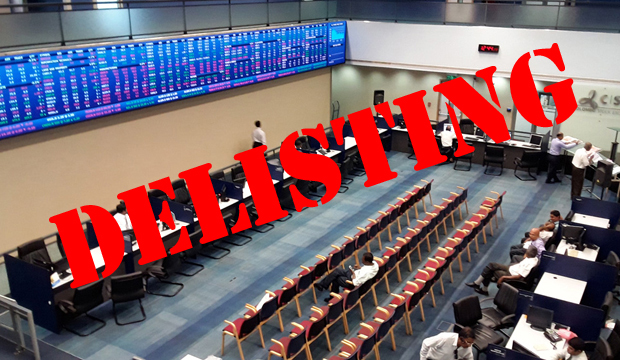 The Colombo Stock Exchange (CSE) will be launching a new index for listed firms in Sri Lanka which have the best environment, social, and governance (ESG) sustainable disclosures, a top official said. "Will will be launching an ESG Index," CSE Research and New Products Head Nishantha Hewavithana said. The groundwork for the new index is already complete, and CSE is evaluating the correct time to launch it, he said. He was speaking at a forum organized by the CSE and GRI (Global Reporting Initiative) on sustainable reporting. "The constituents are companies with a high level of disclosure," Hewavithana said. "In addition to size and liquidity, there will be an ESG score for disclosure with a maximum score of 800," he said. He said the index will be formed under Standard and Poor Dow Jones Indices criteria, and will include 20 firms. GRI has separate ESG reporting criteria, which if followed may also lead to a higher ESG score, Hewavithana said. GRI chief executive Tim Mohim said companies with higher ESG disclosures have higher earnings per share, and return on equity. "Some may say it's a correlation and not causation, but it has happened over a number of years," he said. "Better managed companies would measure these (ESG) issues." Mohim said 93 percent of the largest 250 listed firms in the world disclose their ESG indicators, with 75 percent also disclosing under GRI criteria. The 75 percent of the 100 largest first in 49 countries disclose ESG indicators, with 63 percent disclosing under GRI. He said in Sri Lanka, 100 firms make GRI reports, out of 297. The CSE is a part of the United Nations Sustainable Stock Exchanges initiative. The Sri Lankan rupee closed stronger on Thursday due to dollar inflows from inward remittances ahead of the traditional New Year celebrations, market sources said, while stocks snapped an eight-session losing streak to end higher. The currency extended gains into a third session to end firmer at 176.10/25 to the dollar, up from Wednesday’s close of 176.20/40. The rupee has climbed 1.1% so far this week and 3.7% this year as exporters converted dollars and foreign investors purchased government securities amid stabilising investor confidence after the country repaid a $1 billion sovereign bond in mid-January. Dealers expect pressure on the currency to ease with more inward remittances ahead of the traditional Sinhala-Hindu New Year on 14 April. The Colombo Stock Exchange index ended 0.81% firmer at 5,556.28 on Thursday, edging up from their lowest since 18 December 2012, hit in the previous session. The benchmark stock index slipped 1.36% last week, recording its seventh consecutive weekly drop. The index has declined 8.2% so far this year. The market awaits for some positive news from the third and final vote on the 2019 Budget, scheduled for 5 April, market sources said. Turnover was Rs. 457.8 million ($2.60 million), less than this year’s daily average of Rs. 656.6 million. Last year’s daily average came in at Rs. 834 million. Foreign investors sold a net Rs. 46.8 million worth of shares on Thursday, extending the year-to-date foreign outflows to Rs. 6.21 billion worth of equities so far this year. ECONOMYNEXT- Sri Lanka's stocks closed 0.13 percent higher on Friday, on the back of banking and finance shares, provisional data showed. The stocks rally continued for the second consecutive day, after sliding for two weeks till Thursday. The All Share Price Index (ASPI) closed 7.13 points higher at 5,563.41. The ASPI had fallen to an intra-day low of 5545.59 in the morning session, before reaching an intra-day high of 5568.10 five minutes before market close. The more liquid S&P SL20 Index closed 16.57 points higher at 2,753.06. Market turnover was 326.6 million rupees. Ceylinco Insurance contributed the most to the ASPI gain, closing 98.80 rupees higher at 2,123.60 rupees per share. Commercial Bank closed 2.06 rupees higher at 99 rupees per share and Seylan Bank share ended 6.48 rupees higher at 62.80 rupees, also pushing the ASPI up. The Sampath Bank share was the most active, generating a third of the turnover, and closing 4.40 rupees higher at 182.50 rupees. John Keells Holdings, which led the rally on Thursday closed 30 cents higher at 156.30 rupees per share on Friday, generating the second highest turnover. Mar 29. 2019 (LBO) – The United Kingdom is one of the major trading partners of Sri Lanka, amounting to over 10 percent of the total annual trade. The trade between two countries has been on the upsurge for the last 18 years. In this context, the GSP+ scheme under which Sri Lanka observes a great deal of preferential market access to the European Union including the U.K., paves way to an immense potential to further enhance the trade performance between the two countries. However, the advent of Brexit gives rise to a new set of concerns to Sri Lanka. Thus preventive measures must be taken to secure and maintain the current preferential market access to the U.K.
Sri Lanka exports nearly US$ 3.0 bn. worth of goods to the European Union and 29% of these exports are dominated by the U.K. amounting to approximately US$ 1.0 bn in 2018. Even though the other members of the EU are equally strong economically, their purchases from Sri Lanka are less than what is purchased by the U.K. The below images depict the export market share and the major products exported to the U.K.
Apparel is the most exported product to the U.K. in the diversified product basket. However, it is visible that there are more opportunities to penetrate the U.K. market through an array of further diversified products. When considering the sectors identified in the National Export Strategy, there is only 0% – 2% exports in the U.K. Hence, it is important to identify the market orientation and the capabilities of Sri Lanka to cater the U.K. market in these product sectors. Sri Lanka currently has market access to the European Union, including the U.K. through the current European Union scheme of Generalized System of Preferences [Regulation (EU) No 978/2012 of the European Parliament and of the Council of 25 October 2012], which came in to effect on the 1st January 2014 for a 10-year cycle and is due to end on the 31st December 2023. This scheme aims to support economic growth and job creation in the beneficiary countries by generating increased export revenue. While benefiting from the market access gains offered under preferential import duty concessions under the standard GSP Scheme since 01.01.2014, Sri Lanka was readmitted to the EU Special Incentive Arrangement for Sustainable Development and Good Governance (GSP Plus) Scheme as from 19th May 2017. Despite services exports are not benefiting through GSP+ concessions, the trade potential for the services sector is promising. Efforts need to be explored to enhance trade between U.K. and Sri Lanka by promoting more services exports to this market. In this regard, Sri Lanka looks forward to promoting ICT/BPM and Wellness Tourism to further promote Sri Lanka’s exports in the U.K. to secure the share and get the support of the Sri Lankan diaspora in the United Kingdom in such promotions. In a scenario of the U.K. leaving the EU with/without a trade deal, the main preoccupation of the GOSL will be, at least to secure the existing market access opportunities, which Sri Lanka is currently enjoying under the EU-GSP+ Scheme. However, in view of the U.K.’s long-standing favourable policies of trade and development with developing countries in the form of tariff and non-tariff concessions, it is highly unlikely that the U.K. will entirely terminate the EU-GSP+ Scheme when it leaves the EU after March 2019. Rather, the current EU-GSP Scheme will be continued over a period until the U.K. comes up with its own preferential tariff scheme outlining the criteria for selecting beneficiary countries, rules of origin and other measures. Considering that Sri Lanka currently benefits from a positive and growing balance in its merchandize trade with the U.K., it is important for Sri Lanka to be able to enjoy the existing GSP+ concessions for some time until it is graduated from the scheme, few years after it first reaches the threshold of the World Bank ranking of Upper-Middle Income category. Sri Lanka does not have many years to be complacent of its current status. Therefore, a dialogue with the British government has already commenced at a very high level, which aims to ensure that Sri Lanka will continue to reap the benefits through an array of measures implemented by the U.K. Government in the form of tariff and non-tariff concessions. In a scenario of the U.K. leaving the EU with/without a trade deal with the EU, it is imperative that Sri Lanka’s trade position with the U.K. secured. In this context, the Research Intelligence Unit (RIU), in association with the Sri Lankan High Commission in London, will be maintaining on-going surveillance on the Brexit situation as it evolves highlighting its critical impact and consequences for current and perspective U.K. – Sri Lankan exporters/importers. Mar 31, 2019 (LBO) – Sri Lanka’s Securities & Exchange Commission has filed an action before the Fort Magistrate’s Court against Dr. Sena Yaddehige, for dealing in the shares of Kegalle Plantations. The commission says being the Chairman of the Company, just before a 45 rupees dividend was declared by Kegalle Plantations on 10th July 2015, which is in breach of Section 32 of the SEC Act No. 36 of 1987 (as amended). The SEC said in a statement that it also cited Subramanium Thinamany as a defendant in this case for aiding and abetting Dr. Yaddehige to commit the offence of insider dealing. The Magistrate having taken cognizance of the submissions of Sudarshana De Silva, Deputy Solicitor General of the Attorney General’s Department who appeared for the SEC, issued summons on Dr. Yaddehige and Thinamany to appear before the Magistrate on 28th March 2019. On that day Thinamany has appeared before the Magistrate while the Attorney-at-Law who represented Dr. Yaddehige took notice of the next date Dr. Yaddehige was required to appear before the Learned Magistrate. Meanwhile, on 21st March 2019, an order was sought from the Court of Appeal by Dr. Yaddehige in the Writ application filed by him against the SEC, to stay the proceedings of the Magistrate’s Court. Shaheeda Barrie, Senior State Counsel of the Attorney General’s Department making submissions on behalf of the SEC objected to Dr. Yaddehige’s request. Upon hearing the submissions of both parties the Court of Appeal bench comprising Justice Kumudini Wickramasinghe and Justice Mahinda Samayawardane refused to grant the interim relief sought by Dr. Yaddehige.